AUSTIN, TX -- If you see a penny, pick it up, then all day, you'll have good luck - and possibly $1,000! Financial services firm Ally has hidden 100 "lucky pennies" in 10 cities across the United States as part of their effort to demonstrate the value of every cent. 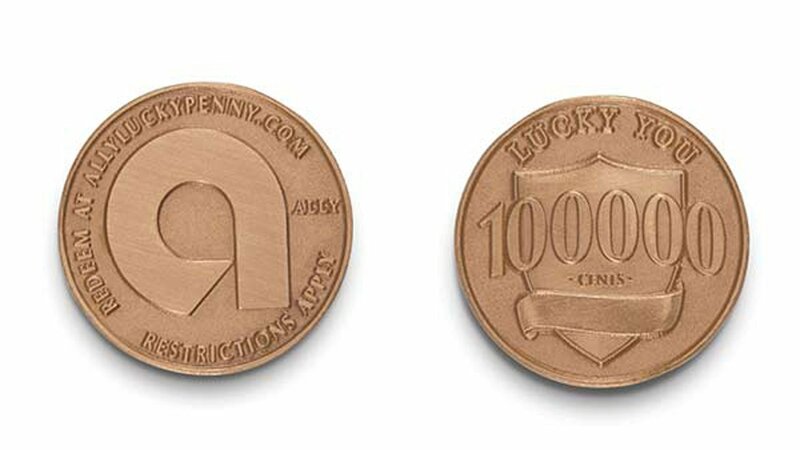 Ally said the "lucky pennies" are slightly larger than a regular penny, with the Ally logo on the front and the number 100,000 on the back, signifying how many cents the Ally Lucky Penny could be worth. Hey, #AllyLuckyPenny hunters! Please remember that all pennies are located in plain sight in public places. Stay safe, and good luck! If you find one, it can be redeemed online for $1,000 at AllyLuckyPenny.com by entering the redemption code on the back of the penny. Ally said the hidden pennies were placed Wednesday in Chicago as well as Austin, Texas; Charlotte, N.C.; Denver, Detroit, Los Angeles, Miami, New York, San Diego and Washington, D.C.